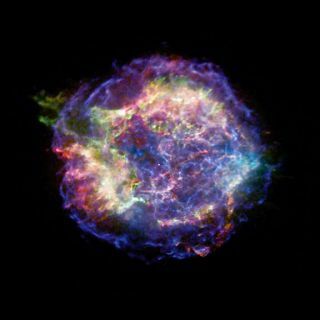 Chandra X-ray Observatory image of the supernova remnant Cassiopeia A. The red, green, and blue regions in this X-ray image of Cas A show where the intensity of low, medium, and high-energy X-rays, respectively, is greatest. While this photo shows the remains of the exploded star, light echoes show us reflected light from the explosion itself. A star that died in a supernova explosion has been resurrected by a team offorensic astronomers that has built a new 3-D view of the long-dead objectusing echoes of light. Astronomers were able to assemble one of the first 3-D perspectives of thesupernova remnant Cassiopeia A by observing light that is reflected off ofinterstellar dust scatted throughout the Milky Way. The supernova explosion that created Cassiopeia Aemitted light that reached Earth approximately 330 years ago. But, some of thatlight encountered celestial traffic, reflecting off clouds of interstellar dust- meaning it is just now reaching us on Earth [howlight echoes work]. This faint light is what astronomers detected and used to create the newperspectives of Cassiopeia A from multiple angles. Light, like sound, can be delayed depending on the time ittakes for it to travel to the dust and reflect back. As a result, lightechoes from supernovas can reach us hundreds of years after the supernovaitself has faded. Thedust clouds act like mirrors, creating light echoes from different directions,depending on where the clouds are located, said Armin Rest, an astronomer fromHarvard University who led the Cassiopeia A project,in a statement. "Justlike mirrors in a changing room show you a clothing outfit from all sides,interstellar dust clouds act like mirrors to show us different sides of thesupernova," Rest said. ForCassiopeia A, scientists first observed its light echoes using the Mayall 4-meter telescope at KittPeak National Observatory in Arizona. Theythen used the 10-meter Keck I telescope on Mauna Kea in Hawaii to study thelight echoes in depth and compare their component spectrums. These findingsallowed the astronomers to measure the expansion speeds of the ejected gases. "Oneof the big uncertainties in our understanding of how massive stars explode iswhether the explosions are spherically symmetric, the same in alldirections," said Alex Filippenko of theUniversity of California, Berkeley, who conducted the supernova echo project atthe Keck Observatory. "Up until now, we have had some indirect evidencefor asymmetries, but our new Keck observations of light echoes directly revealthem." The Keck spectra ultimately revealed that ejectedgas was streaming away from the dying star faster in one particular directionthan in others. In the fastest direction, gas was hurtling away from the deadstar at nearly 9 million miles per hour (or 2,500 miles per second) faster thanin any other direction. Thisled scientists to believe that the explosion may have kicked gas one way andthe neutron star (the shrivelled remainsof a star composed entirely of neutrons) out the other side, scientistssaid. This would be consistent with Newton's third law of motion, that everyaction has an equal and opposite reaction. Pastobservations have already shown that the neutron star at the heart ofCassiopeia A is zooming through space at nearly 800,000miles per hour in the opposite direction of its light echo, researchers added. "Nowwe can connect the dots from the explosion itself, to the supernova's light, tothe supernovaremnant," said Ryan Foley of the Harvard-Smithsonian Center for Astrophysicsand co-author of the study. Furthermore,Filippenko noted that theoretical astrophysicistswill now have reason to include asymmetries in their physical models of howmassive, dying stars explode.